Background: Simultaneous analysis of epinephrine and tyrosine as two effective and important biological compounds in human blood and urine samples are very important for the investigation of human health. Objective: In this research, a highly effective voltammetric sensor fabricated for simultaneous analysis of epinephrine and tyrosine. The sensor was fabricated by the modification of glassy carbon electrode with ZnO-Pt/CNTs nanocomposite (ZnO-Pt/CNTs/GCE). The synthesized nanocomposite was characterized by SEM method. 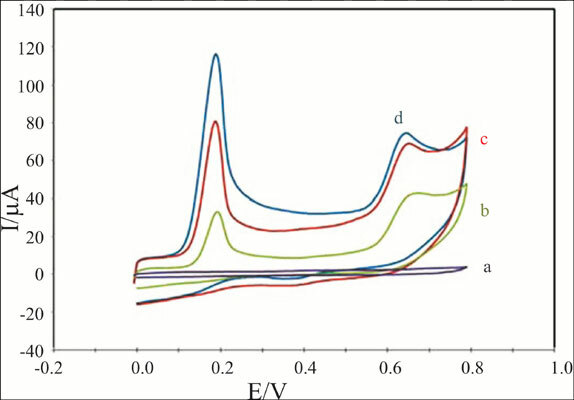 The ZnO-Pt/CNTs/GCE showed two separated oxidation signals at potential ~220 mV and 700 mV for epinephrine and tyrosine, respectively. Also, we detected linear dynamic ranges 0.5-250.0 µM and 1.0-220 µM with a limit of detections 0.1 µM and 0.5 µM for the determination of epinephrine and tyrosine, respectively. The ZnO-Pt/CNTs/GCE was used for the determination of epinephrine and tyrosine in blood serum and human urine samples. Epinephrine, tyrosine, ZnO-Pt/CNTs nanocomposite, electrochemical sensors, carbon electrode, biological compounds.